Case Skid Steers have changed a lot since their debut in 1969, they have changed from being called a Uni-Loader with a Deutz Diesel to being the Case Skid Steer they are today with their own family of Case engines. One thing that has not changed in the machine is the fact that they always will need tires. Monster Tires has the largest in stock selection of Case Skid Steer Tires for the best prices in the industry. Contact Monster Tires to get prices on Case Skid Steer Tires or to find out the different options we have for your model. We carry 430 – 465 Skid Steer Tires, 1825 Skid Steer Tires, SR210 – SR250 Skid Steer Tires, SV185 Skid Steer Tires, SV250 – SV300 Skid Steer Tires, SR130 – SR200 Skid Steer Tires, 1840 Skid Steer Tires, 410 – 420 Skid Steer Tires, or 40XT – 85XT Skid Steer Tires, and more. Trust our Fully Staffed 9-5 Office of Construction Equipment Tire Experts on all Case Machines! Part of customer service is ensuring that our customers have the answers they need and that they are confident in the help they get. That is why we have experts onsite to answer all your questions and provide all the help you need. 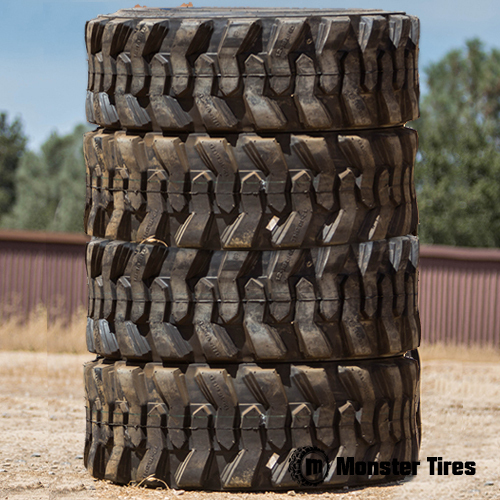 Trust in Monster Tires for your next set of Case Skid Steer tires!